Shades of Enid Blyton’s Amelia Jane apart, Shreekumar Varma’s story about a creature that holds a seaside village to ransom is fascinating. The story starts with the author wondering why a rich old stranger left his house to him— till he finds a book written by Mr Anchanbey, the grandfather of the benefactor. 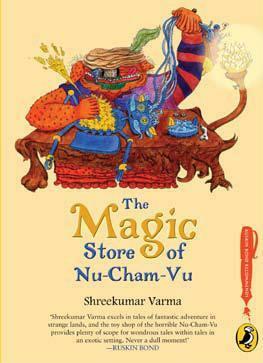 This book is about the reasons (Nu-Cham-Vu is one of the reasons) for the large-heartedness of the old man and about other stories in the village of Anchan Bay, which housed the magic store that Nu-Cham-Vu owned. Nu-Cham-Vu is an oil-barrel-shaped creature children love and adults hate. The children like him because of the beautiful, magical, children-only store that he owns. The store is unique in the sense that the talking toys sell themselves. No parents are allowed inside. No money changes hands. It is all on barter. If, for instance, a boy wanted to buy a toy monkey, he had to stand on one leg for an hour. Payments had to be made in whatever way Nu-Cham-Vu fancied. Since the children don’t understand a single word of his language, the creature translates everything through the Jasmine Doll.